UNITED NATIONS, Jul 07 (IPS) - Secretary-General Ban Ki-moon, addressing delegates in a run-up to an international Ebola recovery conference, said last month that "all of the investments, all of the sacrifices and all of the risks by relief workers" would be squandered if an outbreak of the disease recurs. 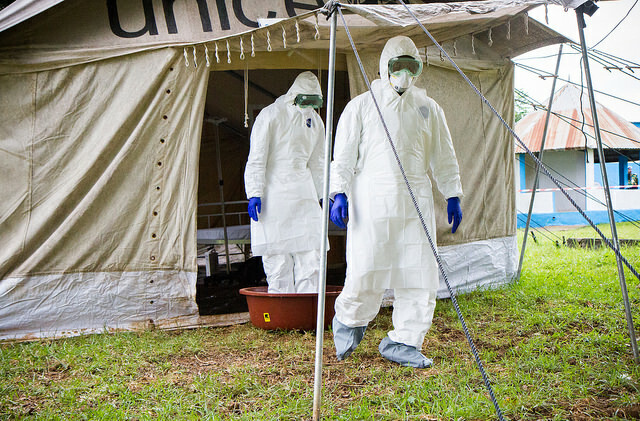 The World Health Organisation (WHO), which made that declaration on May 9, confirmed that a 17-year-old Liberian who died of Ebola last week had been in contact with nearly 200 people possibly triggering the spread of the infection. As of last week, more than 27,100 people were affected by the highly contagious disease, which killed over 11,100, mostly in three African countries: Guinea, Sierra Leone and Liberia. Against this backdrop, the United Nations is hosting a high-level international Ebola Recovery Conference July 10, primarily to provide a platform for the three countries to share their recovery plans and, more importantly, to raise funds to continue the fight against the disease and also strengthen health care systems in the region. Nicolas Douillet of the U.N. Development Programme (UNDP) in Africa told IPS the conference aims to mobilise the international community in support of the three countries. The total needs identified by the three countries, and regionally, by the Mano River Union, he said, amount to 7.2 billion dollars for the next 24 months - 3.2 billion for the three countries and 4.0 billion for the Mano River Union, an Intergovernmental Institution comprising Sierra Leone, Liberia, Guinea and Cote d'Ivoire. The total requested, however, is 9.0 billion dollars, of which 1.8 billion is already committed, leaving a financing gap of 7.2 billion dollars. Speaking of the need for strong health care systems, former U.S. President Bill Clinton told a U.N. meeting last May that severely limited resources were a "staggering burden" – and countries in West Africa were requesting funds to build better and stronger health systems through multi-year plans. Before the Ebola outbreak, he said, Liberia had just one physician for every 71,000 people. He said Ebola had been in many fundamental ways a "man-made disaster." "Guinea, Liberia, and Sierra Leone entered the Ebola epidemic with severely underfunded health systems," said Dr. Matshidiso Moeti, WHO Regional Director for Africa. "After a year of handling far too many severely ill patients, the surviving staff need support, better protection, compensation, and reinforcements. The existing facilities need a complete overhaul, and many new structures need to be built. If another outbreak strikes, the toll would be far worse," he warned. Sarah Edwards, head of Policy & Campaigns at Health Poverty Action, told IPS: "Yes, there certainly needs to be a focus on the longer term need for health systems strengthening at this conference and across the wider Ebola response, and specifically this needs to consider how health systems in Ebola-affected countries can be funded sustainably." She said this should include measures to support affected countries to explore the potential for increased tax revenues to fund HSS; take action to stop illicit capital flight; and pay compensation for any health workers trained in affected countries who are now working in the UK. After a visit to the region last October, Magdy Martínez-Solimán, U.N. Assistant Secretary-General and Director of UNDP's Bureau for Policy and Programme Support, said: "This devastating health crisis is destroying lives and communities. It is also impairing national economies, wiping out livelihoods and basic services, and could undo years of efforts to stabilize West Africa." "As we work together to end the outbreak, now is the time to ensure these countries can also continue to function and swiftly get back on their feet," he added. Guinea, Liberia and Sierra Leone, already suffering from some of the lowest levels of human development in the world, had emerged from years of civil conflict and political instability and were starting to make encouraging progress, according to UNDP. Last September, the United Nations established the U.N. Mission for Ebola Emergency Response (UNMEER), a single structure that will aim to stop the spread of the disease and prevent it from appearing in unaffected countries, as well as treat and care for the infected. The UNDP said gross domestic product (GDP) in Guinea, Sierra Leone and Liberia has shrunk by two to three percentage points. The countries are now projected to lose a total of 13 billion dollars as a result of Ebola. People's livelihoods are shrinking from lost wages and decreased productivity. The participants in Friday's conference at the United Nations include: President Robert Mugabe of Zimbabwe, Chair of the African Union (AU), Alpha Condé, President of Guinea; Ellen Johnson Sirleaf, President of Liberia and Ernest Bai Koroma, President of Sierra Leone. The meeting is in partnership with the AU, the European Union (EU), the World Bank and the African Development Bank (AfDB). The AU will hold its own "International Conference on Africa's Fight Against Ebola" July 20-21 in Malabo, Equatorial Guinea. Meanwhile the Washington-based ONE campaign said keeping track of pledges and monitoring their disbursement, has proved difficult and - at times - impossible "because of inconsistent, inefficient, and often opaque reporting processes and standards." "But in the case of the Ebola outbreak, this question has been incredibly difficult to answer — and that's a huge problem," ONE's Global Health Policy Director Erin Hohlfelder said. "If we don't know what has really been pledged and delivered, no one can adequately match promised resources to the needs on the ground. That means gaps cannot be easily identified and we risk losing time, resources, and lives."